Reflection Lakes in Naples, FL is a community that will appeal to welcomes residents of all ages. With just over 600 homes, this affordable gated community enjoys a prime location in the popular city of Naples. Set amid 30 acres of lakes and 26 acres of scenic preserves, nature-lovers will enjoy the community's many outdoor sports and recreational amenities. Reflection Lakes offers many amenities that support an active lifestyle, including a state-of-the-art fitness center and a resort-style heated swimming pool. Lighted tennis courts, volleyball and bocce ball courts are just some of the community's outdoor activities. Between the community amenities and the many activities available throughout the Naples area, Reflection Lakes is an ideal destination for any homebuyer. Reflection Lakes is a comfortably-sized community with plenty of amenities. The spacious 8,000 square-foot clubhouse includes a state-of-the-art fitness center with both cardiovascular and strength-training equipment as well as an aerobics studio. There are billiards and card rooms, as well as a meeting room. A community center and catering kitchen are ideal areas for hosting social events with neighbors. Outdoors, residents can enjoy the heated resort-style swimming pool, which includes swim lanes and a children's pool and splash park. A large deck surrounding the pool includes space for sunbathers and those who prefer shaded lounge areas. There are also four lighted tennis courts, a sand volleyball court, a bocce ball court, and a children's playground. The barbecue and picnic pavilion are also great outdoor areas for socializing with neighbors. Homes in Reflection Lakes are available in single-family, duplex, villas, and coach home models, which span a large range of sizes and prices. The community was originally started in 2005 by Engle Homes, who built approximately 290 homes before exiting the community in 2008. The Engle models are now available on a resale-only basis. In 2012, Lennar Homes began construction and then a few years later Neal Communities also began developing on the remaining homesites in the community. Both builders offer a variety of single-family homes and attached villas. For buyers looking at resale home options, coach homes offer affordable living in several distinct floor plans. Residents who prefer a coach home can choose a single-story end unit, or a two-story middle unit. These models range in size from 1,368 to 1,710 square feet and offer three bedrooms, two to two-and-a-half bathrooms, and a one-car garage. Reflection Lakes' thoughtfully designed duplexes are single-story homes built by Engle Homes that are a bit larger at 2,222 square feet with two or three bedrooms, two bathrooms, and a two-car garage. The Engle Homes single-family collection are available in 13 different models, ranging from 1,881 to 3,260 square feet. These single-family homes include three to five bedrooms, two to three-and-a-half bathrooms, and two to three-car garages. These single-family homes are available as one or two-story floor plan. The Lennar Homes are available in single-family models that range from 1,340 to 3,357 square feet and attached villas that are 1,417 square feet. The single-family homes come with three to five bedrooms, two to three-and-a-half bathrooms, and two to three-car garages. The villas have three bedrooms, two bathrooms, and a two-car garage. The Neal Communities models come in two home styles: attached and single-family. The attached home features 1,524 square feet of living space with two bedrooms, a den, two bathrooms, and an attached two-car garage. There are five distinct single-family home designs that range in size from 1,772 to 2,914 square feet. The single-family homes have three or four bedrooms, two to three-and-a-half bathrooms, and an attached two or three-car garage. 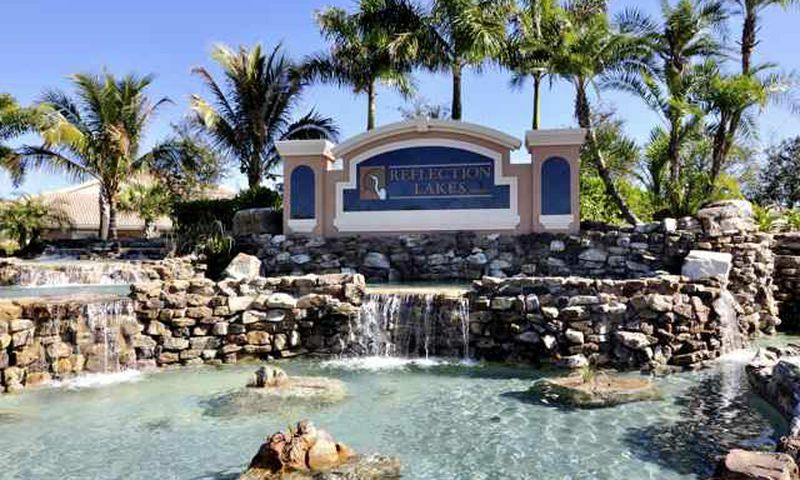 Reflection Lakes is an ideal community for residents who want affordable living in the heart of beautiful Naples. The community brings the energy and diversity of an all-age neighborhood, while offering amenities that support an active lifestyle. Residents can enjoy the community's various amenities as well as everything that nearby Naples has to offer. A full-time activities director is available to plan community events and help residents make the most of their time while living at Reflection Lakes. The added security of a gated community makes Reflection Lakes a great community for both year-round residents and wintering snowbirds. The community plays host to a variety of clubs and activities, such as bocce, bridge, yoga, zumba, water aerobics, and pot luck events. Reflection Lakes is located in the popular city of Naples within easy access of the bustling routes 951 and 41 corridors. Downtown Naples offers a variety of cultural and recreational activities, including many fine restaurants. Shopping centers in the area range from small specialty shops to large chain department stores, and include the 5th Avenue South and 3rd Street South antique shopping districts. Situated on Florida's gulf coast, Naples is known for its pristine white beaches and large nature preserves. The area has fantastic fishing, boating, and waterfront activities, and has a beautiful tropical climate. With the attractions of an urban area and the recreations of a prime vacation destination, Reflection Lakes in Naples is a prime location for buyeres who desire resort-style living. There are plenty of activities available in Reflection Lakes. Here is a sample of some of the clubs, activities and classes offered here. These attached townhomes were built by Engle Homes. They have three bedrooms, two to two-and-a-half bathrooms, and a one-car garage. Townhomes range from 1,368 square feet to 1,710 square feet. These homes are available as resale only. Attached villas by Lennar are 1,417 square feet. They feature three bedrooms, two bathrooms, and an attached two-car garage. This attached home by Neal Communities offers 1,524 square feet of living space. It has two bedrooms, a den, two bathrooms, and an attached two-car garage. Homebuyers will love the open layout, walk-in closets, formal dining room, family room, and spacious master suite. Attached villas by Engle Homes feature two bedrooms, a den, two bathrooms, and an attached two-car garage. These homes are 2,222 square feet and the den can be turned into an optional third bedroom. These homes are available as resale only. The Trophy Series are made up of single-family homes built by Engle Homes. They have three to five bedrooms, two to three-and-a-half bathrooms, and a two-car garage. These spacious floor plans range in size from 2,235 square feet to 2,874 square feet. These homes are available as resale only. Engle Homes in the Premier Series are single-family homes that range from 1,881 to 3,260 square feet. They feature three to five bedrooms, two to three bathrooms and two to three-car garages. These homes are available as resale only. Executive Homes by Lennar range from 1,340 square feet to 3,357 square feet. These single-family homes feature three to five bedrooms, two to three-and-a-half bathrooms, two to three-car garages. Some of the models feature dens or additional bedrooms. Neal Communities offers five distinct floor plans that range in size from 1,772 to 2,914 square feet. They have three or four bedrooms, two to three-and-a-half bathrooms, and an attached two or three-car garage. What a wonderful community! Like a dream, after leaving the cold winter behind. While I was visiting, I found a great little home for sale. The pool is beautiful and the card room is great for games. Our grandkids love to visit and always ask to go over to the play area. My husband and I have both found things we love here and have made many new friends! 55places.com is not affiliated with the developer(s) or homeowners association of Reflection Lakes. The information you submit is distributed to a 55places.com Partner Agent, who is a licensed real estate agent. The information regarding Reflection Lakes has not been verified or approved by the developer or homeowners association. Please verify all information prior to purchasing. 55places.com is not responsible for any errors regarding the information displayed on this website.